As many of you know, at the end of each year food bloggers have united, under the coordination of Chez Pim, to hold a massive raffle to raise money for charity. In 2007, we raised over US$90,000 to help the UN World Food Programme. The UN World Food Programme has been choosen again as the benefactor for this charity drive. Cool! How can I help? For each $10 you donate, you will get one raffle ticket toward a prize of your choice. At the end of the campaign (December 15-25), the raffle tickets are drawn and the results announced on Chez Pim. Like what kind of prizes? How about dinner in New York with New York Times wine critic Eric Asimov? A dinner for two with wine pairing at Manresa? A wine vacation at Meadowood Resort in Napa? A custom made Japanese chef's knife? Dinner for 8 at Momofuku Ssäm Bar? Lighting kits for the photography nerds? You can check out this year's Menu for Hope prize lists below. They are divided into regions by blogger, but you can bid on items from any region. Or you can save yourself some time and just put all of your raffle tickets towards our great prize. Once again, Morgan Ranch has been kind enough to provide us with an awesome prize package. 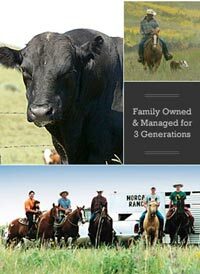 Morgan Ranch has been breeding Wagyu in Burwell, Nebraska since the early 1990's using genetic stock acquired directly from Japan. One of the first Wagyu breeders in the United States, Morgan Ranch was also one of the few to pass stringent genetic, management and production requirements for shipping the prized beef back to Japan. Morgan Ranch remains one of the largest producers of Wagyu beef in the country. So a special thanks goes out to Morgan Ranch for providing us with a Wagyu Beef combo package to be raffled off. The package includes a wagyu beef carving roast, perfect for these winter months and 10 pounds of ground wagyu beef to throw a killer summer barbecue once the temperatures start rising again (or if you're impatient, make a meatloaf like no other right now). All the qualities that make Wagyu beef worth enjoying also make it worth sharing with our Morgan Ranch Wagyu Carving Roast. 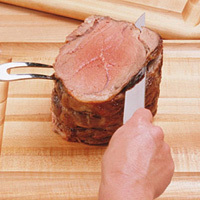 The most flavorful of all the roasting cuts, it offers unmatched tenderness and texture as well. Its generous 7-pound size makes it the right size for every occasion. Now everything you make tastes better with Morgan Ranch Wagyu Ground Beef. 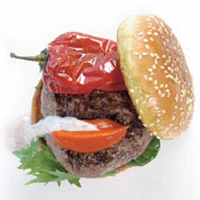 Create steak burgers unlike any you've ever had -- grilled or pan-fried. Averaging 81 to 84% lean, it offers a flavorful selection as part of a healthy lifestyle or as part of your favorite sauces and meatloaf recipes. Includes 10 1-pound packages. **Includes free 2nd day shipping within the continental US. Check out all the items up for raffle benefiting Menu for Hope 5. Pay attention to the prize code listed next to the item(s) you want to win. Once you decide which prize buckets you want your raffle tickets to go towards, visit the donation site and follow the instructions. I'll post a winners announcement when it becomes available on January 10th. Good luck and thank you in advance to all who donate. Happy holidays to all! 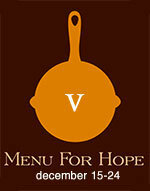 Donate: At the Menu for Hope 5 donation site on firstgiving.com. Sponsors: Thanks to Morgan Ranch for supplying us with some great gourmet wagyu beef to give away. Taste Magazine Takes a Look at Morgan Ranch's Wagyu Beef and Falls in Love! Wall Street Journal Puts Morgan Ranch Wagyu To The (Taste) Test.